USA’s Vincent Zhou performs his Short Program at the 2019 Four Continents Figure Skating Championships. USA’s Vincent Zhou took a surprising lead ahead of South Korea’s Junhwan Cha and defending champion Boyang Jin of China in the Men’s Short Program at the 2019 Four Continents Figure Skating Championships. Zhou, who is making his first appearance at this event, was in the zone. The 2018 Tallinn Trophy silver medalist was focused yet showed expression in his routine to music by Muse. He opened with a strong quad Lutz-triple toe, racking up nearly 20 points out the gate. He then followed up with a quad Salchow and triple Axel while displaying strong level 4 spins and footwork throughout. He scored a whopping season’s best of 100.18, topping his score from Tallinn by nearly 23 points. Cha nailed a quad Salchow which garnered high grades of execution (GOE), along with a triple Lutz-triple loop and triple Axel in his “Cinderella” routine. The 17-year-old earned a season’s best of 97.33, topping his score of 90.33 from earlier this season at 2018 Autumn Classic where he finished second. It is also his first time competing at the Four Continents Championships. 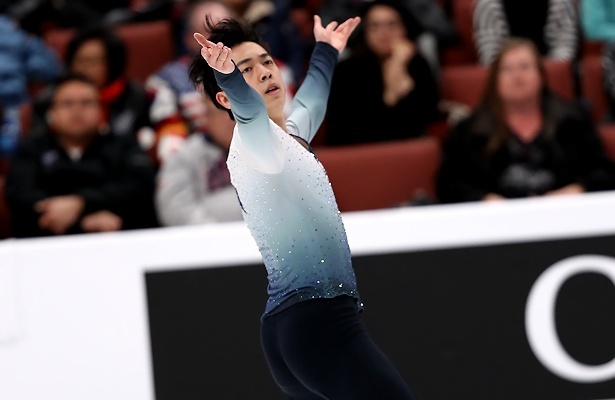 Jin was styling in his short to “While My Guitar Gently Weeps.” While the defending champion stepped out of his opening quad Lutz, he rallied back to land a quad toe-double toe and triple Axel while showing level four footwork and spins throughout. The five-time Chinese national champion scored a season’s best of 92.17, improving from his score at his Grand Prix event in Helsinki. Japan’s Shoma Uno had a tight landing on his opening quad toe, and then stepped out of the back end of triple Salchow-triple toe. The 2018 Olympic silver medalist otherwise showed a strong triple Axel and earned level 4s on all other elements. He is currently in fourth with 91.76, but by no means out of any medal contention. Keegan Messing of Canada landed a quad toe-triple toe, but had to hang onto the landing of a triple triple Lutz and triple Axel in his skate to “You’ve Got A Friend In Me.” Nevertheless, the crowd-pleaser from Anchorage, Alaska, showed good footwork and scored 88.18 for fifth place. USA’s Jason Brown stepped out and put a hand down on triple Axel, but landed a solid triple flip and triple Lutz-triple toe for sixth place (86.57). Keiji Tanaka of Japan showed lots of expression in his bluesy routine to “Memories,” landing a triple Lutz-triple toe and triple Axel, but under-rotated and put a hand down on his opening quad Salchow. He was otherwise solid, earning level 4s on all elements to earn a season’s best of 83.93. Canada’s Nam Nguyen is currently in eighth place (79.55) followed by USA’s Tomoki Hiwatashi (76.95). Nguyen “tweaked” his right foot in practice which is why he substituted in the triple loop for the flip as his solo jump.